to celebrate the lives of our loved ones and Honor our Veterans. Please check in at the welcome table when you arrive. Call Americare at (480) 726-7773 for any additional information/questions. Hospice is a type of care for people facing a life-limiting illness. The philosophy of care shifts from pursuing curative treatment to promoting quality of life. 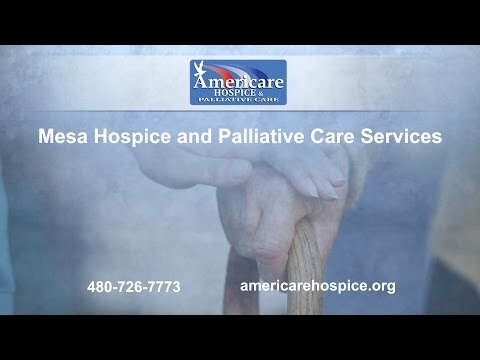 The compassionate nurses, doctors and healthcare providers at Americare Hospice and Palliative Care are committed to providing the best hospice care for people facing a life-limiting illness in Mesa and the surrounding area. It is our goal to help patients live their remaining days with dignity and care. Americare Hospice & Palliative Care is a Phoenix Diocese-approved Catholic organization dedicated to serving people of all faiths. We are uniquely owned and locally operated by a family of Registered Nurses. State licensed and Medicare certified, we offer our comprehensive services Valley wide. We have consistently proven our outstanding performance with 100% deficiency-free routine surveys by Medicare and the Department of Health since our inception in 2005. Our patient satisfaction ratings affirm our phenomenal care with more than 98% of respondents reporting they would recommend Americare Hospice. Read more about what our patients and family members have to say about our exceptional care on our Testimonials page. Americare Hospice and Palliative Care takes a team approach to your loved one’s care that includes our medical team, as well as your family and other loved ones. We believe that it takes a community to care for us all, and we strive to build community around your loved one. Our team is led by the hospice physician, who makes home visits and oversees the work of the rest of the team. Hospice nurses manage patient care, including symptom management, and they visit with the patient regularly. Hospice aides provide care such as bathing and grooming, and social workers counsel the patient and family members on emotional issues related to illness and death. Social workers can also help the family with financial and legal resources. A spiritual counselor is available, as is a bereavement team to help everyone involved deal with grief. Our entire team is committed to the welfare of your loved one and to providing support for your family. We want to make your loved one’s transition as smooth as possible, and we want to help your family cope with these trying times in healthy ways. Americare Hospice and Palliative Care strives to provide the best hospice care in Mesa and the surrounding area. Our healthcare team adheres to the strictest ethical and moral principles to uphold the value of human life at every stage. Our workers are state-licensed, and they provide comprehensive services Valley wide, from East Mesa to Phoenix. We have consistently proven our outstanding performance with 100 percent deficiency-free routine surveys by Medicare and the Department of Health since our inception in 2005. Our patient satisfaction ratings affirm our phenomenal care with more than 98 percent of respondents reporting that they would recommend our services. You can read more about what our patients and family members have to say about our exceptional care on our testimonials page. We provide hospice care in your loved one’s home, and we provide an in-patient facility that has a home-like setting. By providing this atmosphere, we ensure that your loved one is as comfortable as possible and can be surrounded by family members and friends in those last days. Our counselors pay special attention to the spiritual needs of your loved one and your family, and we provide comprehensive grief and bereavement support. At Americare Hospice and Palliative Care, we treat the whole family. A terminal illness or chronic condition that undermines the quality of life can be devastating for an individual and for their family. While there may be nothing that medical science can do to change the prognosis, there is plenty that hospice care can do to change the quality of life during those final days. The interdisciplinary team at Americare Hospice and Palliative Care is here to help your family through this time with compassion and grace. Our comprehensive services also include occupational therapy, physical therapy, nutritional counseling, and alternative therapies like massage and music therapy. We explore every option for providing comfort and relief, no matter the illness or condition. Call us today to learn more about our inter-faith services or to set up a time to meet with one of our hospice care counselors. We serve patients in Mesa and other cities throughout the Valley. Our team can serve patients in their homes, or we can give you more information about our in-patient facility. Do not try to get through these final days alone. Get the support you need, and provide your loved one with relief that can make those days more bearable. The compassionate hospice team at Americare Hospice and Palliative Care can improve the quality of life for everyone at the end of life.